Nursing has been a global profession since ages and it’s increased global demand has created immense opportunities. Chandra Nursing college (Inst.) is the best nursing college in Chhattisgarh state. It aims at providing the best nursing studies and mainly deals with the application of best quality of care by keeping upto date with the latest technological changes in the healthcare system. B.Sc degree from the best nursing college in Chhattisgarh prepares the students to not only make a career in nursing but as well educate them to provide the best of of decision making skills in the nursing college Durg to provide the best of health care in all the situation and tackle any case with ease. A student doing GNM in nursing college in Durg got huge opportunities for future growth, as it’s the subject that offers broad career opportunities at many levels. Our focus on the modern technology and research and development makes Chandra Nursing College (Institute) best nursing college in Chhattisgarh to provide a better future to the mankind. 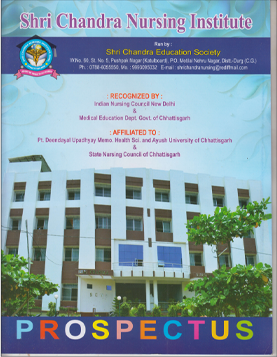 Shri Chandra Nursing College (Inst.) is the the top most nursing colleges in Chhattisgarh that gives and opportunity to get registered as a Nurse to practice either in educational or clinical field.